Kaydon is North America's leading supplier of wind turbine bearings, with a 20+ year track record of supplying slewing ring bearings to the renewable energy market. 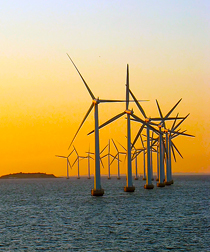 Kaydon's pitch and yaw bearing solutions support critical requirements in a variety of systems, including high and low wind speed; land based or offshore; from 200 kW to 5.0 MW. Four-point and eight-point bearings allow turbine blades to be indexed or positioned to optimize blade angle, depending on wind speed. We apply engineering expertise to best meet critical performance requirements and industry regulations with the most economical design while meeting Germanischer Lloyd and other specifications. Kaydon pitch bearings allow the turbine blade to be indexed or positioned to optimize blade angle, depending on wind speed. Our yaw bearings allow the turbine nacelle to rotate into the wind and support the nacelle on the tower. Kaydon slewing ring bearings for wind turbines feature deep groove gothic arch raceways and maximum ball complement. Integral seals (or non-contact shields, in the case of smaller bearings) assist in the exclusion of contaminants. Kaydon HS, HT, MT and XT series slewing ring bearings feature a four-point contact design that provides exceptional moment, thrust, and radial load capacities. The raceway of the Kaydon KH series four-point contact slewing ring bearings provides four points of contact with the balls, enabling it to carry radial, thrust, and moment loads individually or simultaneously. Kaydon DT series eight point, contact double row ball bearings feature two raceways, located in both the inner and outer rings. This results in a total of eight surfaces the balls may contact at any time, providing exceptional moment, thrust, and radial load capacities. Through precise manufacturing, the raceways are closely matched to provide a high degree of load sharing. 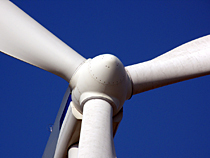 Kaydon's experience in wind energy helps customers specify the most appropriate corrosion resistant materials and coatings, including zinc, paint, or other surface treatments, for meeting critical operating temperatures down to -40°C. Unique sealing arrangements are available for severe operating conditions, and Kaydon manufacturing capability accommodates both internal and external gear designs in both hardened and unhardened conditions. Kaydon engineering expertise provides the optimal bearing solution for solar panel gear boxes and altitude-azimuth mountings. You'll find Kaydon bearings on panels installed on commercial buildings and industrial facilities, in large ground-mounted systems, and in electric utilities projects. The Kaydon Reali-Slim® inch-standard bearing is one of the most widely used thin section bearings in the world. 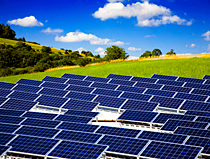 Kaydon provides solar panel designers with solutions in Reali-Slim® ball bearings in radial contact, angular contact, and four-point contact configurations. Kaydon thin section bearing solutions save weight, create space, reduce friction, increase design flexibility, and provide excellent running accuracy. Kaydon also provides solutions in solar panel slewing ring bearings. Kaydon slewing ring bearings allow for large diameters and lighter weight; for optimal economy and capacity in a given envelope dimension; for precise positioning with consistent repeatability, where rotation is constant, intermittent or oscillating; and for designs where the bearing will mesh with other precision mechanical components. Our slewing ring bearing solutions include a variety of four-point ball configurations. Kaydon worm drive rotation systems are pre-engineered and packaged for matched component performance and drop-in design convenience. These systems are an economical, yet high quality component for commercial and industrial equipment that requires rotational power transmission. Kaydon worm drive systems are pre-tested and run-in for mesh compatibility assurance, and are available in 3 torque capacities.